Why do you do what it is you do? Do you ever find yourself questioning the purpose behind everyday tasks? Am I buying this bag of tortilla chips for nutritional reasons or simply to satisfy a craving? Do I need another black skirt or do I simply like this one instead of another? Am I getting into a fight with my husband because there’s an issue we need to resolve or just because I feel like arguing? There are certainly a multitude of reasons for each action we take. This teaching is relating to our parshah this week, Parshat Korach. This narrative details the revolt of Korach and of Datan and Aviram. Korach breaks apart the priesthood and prepares a revolt while Datan and Aviram, two other troublemakers, begin a revolt of their own. Chaos breaks out in the camp, and those who don’t see a purpose to the fight pull away, which becomes a pretty smart idea as the earth opens up and swallows Korach and his followers. Korach had decided that the entire notion of the priesthood, a specified leading class, was unnecessary since the Israelite nation as a whole is holy because of their work at Mt. Sinai. Korach questions why Aaron and his lineage should have this special leadership role, and to be honest, it’s a good question. The problem is that Korach doesn’t seem to want to hear any answers; he simply wants to start a fight. Here’s where Korach was right: we are all holy, we are all a part of the nation. But he was wrong to assume that everyone should be a priest. Division of responsibility is how we form a cohesive and productive society. If we’re all leaders, there is no one to follow. 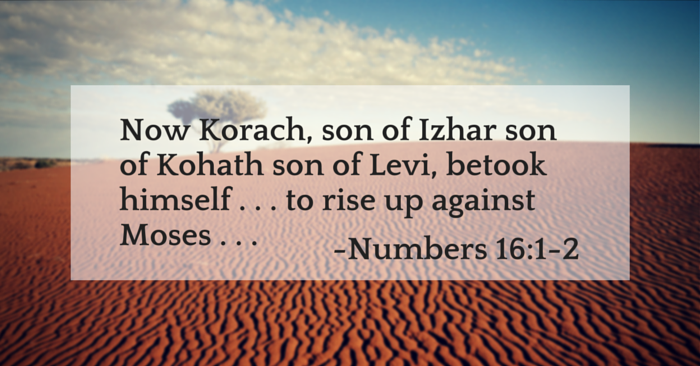 Korach picked a fight because he could, but fighting simply because we can leads to chaos and destruction. However, purposeful conversations, discussions, and even arguments have a place in pushing us to change our thinking and make better choices. These are the disagreements “for the sake of heaven.” Our Torah portion this week teaches us that we must think carefully and strategically about our actions, our desires, and our morals and move forward only when the fight is one that not only benefits us, but benefits the entirety of our community.